American Sniper is NOT a Hero! Join us in protesting anti-Arab racism and whitewashing of American crimes in the Iraq War! Dr. Martin Luther King’s poignant words “Wars are poor chisels for carving out peaceful tomorrows” rang through the streets as we marched alongside healthcare advocates, Palestinian rights activists, students, formerly incarcerated youth and others to #ReclaimMLK last week. Join us to continue Dr. King’s legacy of direct action against war and racism: No Justice, No Peace! February 2nd: Stop Hate, Stop War-Mongering by joining CODEPINK LA outside of a screening of American Sniper featuring Clint Eastwood and Bradley Cooper to protest anti-Arab racism and whitewashing of American crimes in the Iraq War @ 6:30pm outside the Director’s Guild of America Theater at 7920 Sunset Blvd! 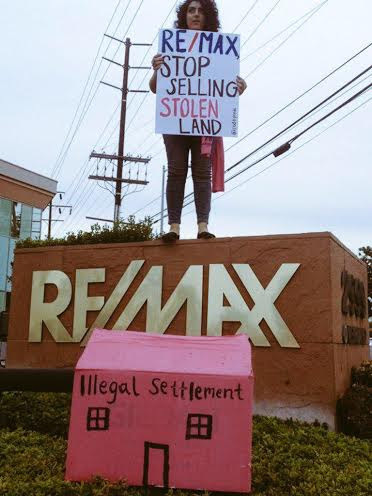 February 3rd: LA Out for Palestine to Stop RE/MAX’s Occupation Profiteering! Join us to condemn RE/MAX real estate’s selling of illegal settlement properties in the West Bank with members of Students for Justice in Palestine, Jewish Voice for Peace and more! We will deliver our national petition, present our #BoycottREMAX demands and have a speak out for Palestine at LA's local RE/MAX office @4:30pm at 4311 Wilshire Boulevard. PS: Mark your calendars for some Valentine’s day love for women on February 14th at 12:30pm with CODEPINK’s event for 1 Billion Rise V-DAY! Learn how to dance and heal against violence by emailingkristin.codepinkla@gmail.com. 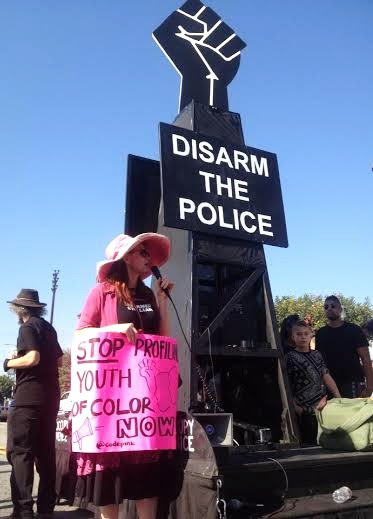 Jodie Evans says Demilitarize NOW at #ReclaimMLK! CODEPINK LA outside RE/MAX office!